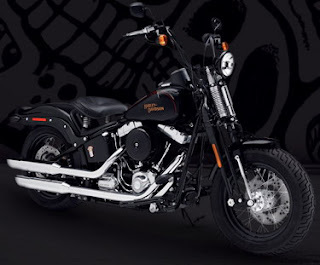 Check out this cool new motorcycle from the King of Motorcycle makers, the Harley-Davidson FLSTSB Softail Cross Bones. God, I just LOVE Harley-Davidson. For me, it's the ultimate king of the road and it I don't know why but every time I see someone riding one, it never fails to make my head turn in their direction. The Harley-Davidson Softail Cross Bones is sure to be another head turner. The design is reminiscent of those bike commonly used by open road bikers but more polished and refined. The Harley-Davidson FLSTSB boasts of a Black andPolished Twin Cam 96B powertrain, unique Softail suspension, and a 6-speed Cruise Drive transmission. The Harley-Davidson FLSTSB Softail Cross Bones motorcycle also has a 5 gallon fuel tank. this is on my to do list and already have ideas how to change it to make it lower and meaner ! !